People new to Reformed theology may wonder just what it was about a five-hundred-year-old historical movement that affects our thinking so much today. 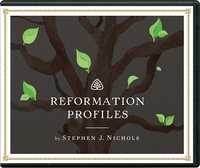 So join Dr. Stephen Nichols for an inviting, approachable take on “Reformation 101,” as he explores the events of the Protestant Reformation from the perspective of important figures from each of four key countries in this new seven-part teaching series. More than a history lesson, Dr. Nichols helps believers understand why the Reformation mattered then and matters now.